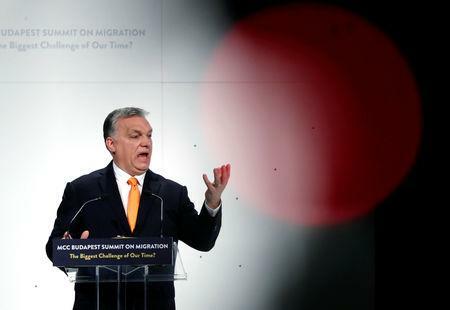 BUDAPEST (Reuters) - Hungarian Prime Minister Viktor Orban's government could resume media campaigns against European Union bodies, he suggested on Sunday, as his nationalist Fidesz party gears up for European Parliament elections due on May 26. On Wednesday the European Parliament's main center-right grouping, the European People's Party (EPP), voted to suspend Fidesz amid concerns it has violated EU principles on the rule of law. The action was triggered in part by Orban's media campaign attacking European Commission President Jean-Claude Juncker, depicting him as a proponent of mass immigration into Europe and as a puppet of Hungarian-born U.S. billionaire George Soros. Orban had ended the media attacks and apologized to members of the EPP, but he again struck a combative tone in an interview with public radio on Sunday. "People are a bit angry with us in Brussels because, at the start of the European Parliament election campaign, we ran an information campaign in Hungary, essentially exposing what Brussels was up to," Orban said. "We have exposed them and, naturally, they are angry." "Our job now is to continuously inform the people about what Brussels is up to," Orban added in Sunday's interview. "We should not back down, we should not be scared because the opponent takes offence and attacks us with the anger of people who are exposed." Asked whether Orban's remarks meant Budapest would resume its anti-EU media campaigns, a government spokesman declined further comment, saying: "The prime minister's words speak for themselves." Orban has also leveled criticism at European Commission First Vice-President Frans Timmermans, the European Socialist candidate to suceed Juncker after the May elections. Orban cast Timmermans as an out-of-touch Brussels bureaucrat living in what Orban called a "bubble". Dutchman Timmermans is broadly disliked by nationalist parties in Eastern Europe, including in Hungary. "Just this week there was a vote transforming the Dutch upper house, where the party of this Timmermans fell over spectacularly. He has lost the confidence of the people. And meanwhile he comes to Budapest and tours European capitals to lecture us about democracy," Orban said. "Such Timmermans-types, who are given the boot at home by their own people, should not be given a position in Brussels, because that will weaken cooperation in the entire EU."